Are you feeling overwhelmed? Is your life filled with too many obligations and not enough joy? 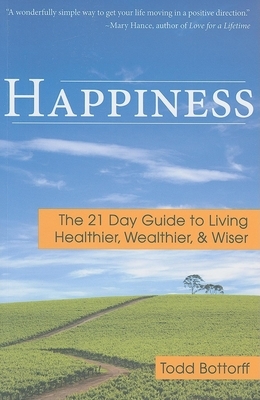 In Happiness: The 21 Day Guide to Living Healthier, Wealthier, & Wiser, you will be given simple, yet extremely effective tools for transforming your life from being out of control, stressed, and unfulfilling to a life of deep meaning, passion, and, of course, happiness. Bottorff developed this simple plan when he realized that his own life had become too much about just making it through the day and not enough about the things that really matter. He needed to make a change--fast. The techniques presented in Happiness were selected by Bottorff for their ability to have a great impact with minimal expense, time, and effort. These ideas can be easily incorporated into the life of someone who already has too much on their plate. And, although this book guides you on a 21-day journey with specific tools and exercises to bring about your reinvention, the results will last a lifetime. - Learn to lose a pound a year by changing one thing - Reduce your stress in three minutes a day - Get a better night's sleep - Build a better relationship with your spouse or significant other - Discover a better model to reduce conflict with others - Prolong your life - Become a happier person with one simple thing. Todd Bottorff is a graduate of Harvard University and the University of Virginia, author, editor, and award-winning publisher. He has edited or published hundreds of titles in varying subjects including creativity, history, and literary fiction. Todd lives with his wife and two children in Nashville.